My husband, Roger, and I had always enjoyed traveling. Paris. Hawaii. Thailand. Another time a trip to Morocco. We owned a timeshare in Cancun, a mere 4-hr flight from home. In 1998, we decided to embark on a different adventure, a special trip, a Russian waterways cruise. Promises of beautiful scenic settings, unforgettable experiences, new friends, all from the comfort of our cruise ship beckoned. We couldn’t wait. Unfortunately, that once-in-a-lifetime trip turned into a lifetime nightmare. Upon return, I discovered I had Mal de Débarquement Syndrome. My symptoms, rocking and swaying, were so debilitating that I had to immediately quit my job. I couldn’t find relief, couldn’t function, or even do normal daily activities. My life was forever changed. Twenty years ago, information on MdDS was sparse. The literature was limited to a few journal articles. Stanford PhD candidate, Evan Torrie, had just built a rudimentary website dedicated to MdDS. But there was no real research yet. 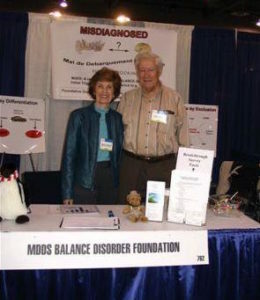 As a result of the challenges in learning about and adjusting to life with MdDS, Roger and I began a crusade to increase awareness about the disorder. Evan’s MdDS on top of the general demands of life caused him to all but abandon his pioneering site within three years, so working with a handful of others like myself, we established an Internet-based support group1 and a new website. << Marilyn and Roger at the DC OTO EXPO in 2007. Project leaders also created several educational tools including: a symptom severity scale, to quantify what we feel so others might understand; a newsletter, which is distributed to an ever-growing number of professionals and patients alike; an educational brochure; and surveys to collect the data that researchers need. Of significant importance, despite of the lack of specific tests to diagnose MdDS, Roger and a volunteer were successful in getting Mal de Débarqement Syndrome listed in the World Health Organization (WHO)’s International Classification of Diseases. The U.S. uses a Clinical Modification for medical diagnoses, and Mal de Débarqement Syndrome can be found under ICD-10-CM Diagnosis Code R42. This information appears on our educational brochure and business cards, available by request. One of the best distribution channels for the brochure turned out to be medical conventions. Volunteers have hosted booths at OTO Expo, speaking with U.S. and international otolaryngologists and associates, researchers in otolaryngology, senior academic professors and department chairs, leaders of international societies, fellows in training, and residents. When we attended the annual meeting of the American Academy of Neurology (AAN), many professionals had diagnosed “a few” patients with MdDS, and the predominant query was, “How can I treat it?”. Doctors were and continue to be extremely excited to receive the data we collect via our online surveys. Basic biomedical research towards an improved understanding and treatment of MdDS finally began in 2008. Yoon-Hee Cha, MD, had already published “Clinical features and associated syndromes of mal de debarquement” with Dr. Robert Baloh, a member of the MdDS Foundation’s Advisory Council of physicians. I even participated in one of Dr. Cha’s early clinical studies, part of a project where she began to examine possible etiologies, diagnostic tests and treatments for MdDS. Findings from this and subsequent clinical research have led to the development of innovative treatment possibilities including rTMS and tDCS.3 Much of this and the current MdDS research was made possible by anonymous donors. And I’ll be blunt; Regular and recurring donations are needed to further it. I hate to write about myself when my symptoms are so high. However, I still play bridge and am trying to read again. We do travel locally now. Since the formation of the MdDS Foundation, so many positive things have happened. I have taken on the role of President of the Board, in spite of my symptoms. Some volunteers from the early days became Board Directors in spite of their symptoms as well, and new key players joined to help. Although Roger has handed over the reins to me and the board, he is a good advisor. Our two very vibrant support groups have about 2,000 MdDS Warriors, posting and sharing experiences with each other, and membership grows daily. And, yes, I am excited about this fact. It means our awareness efforts are reaching those who are undiagnosed or misdiagnosed. Often, for those who do find our groups, the relief in finding out “I am not alone” is overwhelming. As our community grows, so does interest among medical professionals. Our website was recently redesigned with that in mind. Just the other day someone told me about a friend who had been diagnosed with MdDS, thanks to our website. The symptom scale that started out as a list, roughed in collaboratively by support group members, is now an interactive tool that can help others visualize the severity and variability of what we deal with. We have a new website that is modern and exciting, and I think that anyone, including physicians, finding our website will be more aware of the facts about MdDS. I’m so proud of the progress we have made. We have on-going research at the Laureate Institute for Brain Research (LIBR) and at the Ohio Musculoskeletal and Neurological Institute (OMNI at Ohio University). Dr. Brian Clark at OMNI is collaborating with Dr. Mingjia Dai who is at the Icahn School of Medicine at Mount Sinai. More on that later. And independent studies are taking place in NY and other cities. But there is still much work to be done for all of this to lead to prompt diagnosis, treatment and, finally, a cure. Next week, October 28 is Make A Difference Day. It is a day for volunteers and communities to come together with a single purpose: to improve the lives of others. Will you please join me and the MdDS community and make a difference? Volunteer! If you are already putting your shoulder to the wheel and making a difference, I’d love to know! Please tell me what you are doing in the comments. Special thanks to the Board members and Project Leaders who helped me write my, and indeed the Foundation’s, story: Sue Barnes (established first website, support group and newsletter), Ann Brant (assisted with physician list), Marla Cruise, RN (original surveys, Advisory Council and physician list creator, moderator), Donna Hall (ICD-CM), Jane Houghton (retired Board Director, UK representative), Sharon Renschler, Esq. (served as Board President). If I’ve left out your name, please forgive me! Brain fog. Remind me and comment below. 3 Dr. Cha continues MdDS research at the Laureate Institute for Brain Research (LIBR) to improve MdDS diagnosis with PET/fMRI imaging as well as with EEG. In addition, she focuses on evaluation of MdDS treatment with non-invasive neuromodulation approaches including transcranial magnetic stimulation (rTMS) and transcranial direct current stimulation (tDCS). All of her clinical studies are focused, labor intensive, expensive, and necessary as she seeks to improve our understanding of MdDS. I would like to interview someone there about this syndrome for http://www.educationViews.org I would send 8-9 questions via e-mail and someone ( Marilyn Josslyn perhaps )could reply at her convenience. MY e-mail is [redacted for privacy per our Discussion Policy]. Just wondering if anyone has heard of Dr. Kim Fox using GyroStim for Mdds treatment. It seemed to have helped a couple of Mdds sufferers. I have the constant swaying feeling too, and I feel the frustration w no firm diagonosis, all other vestibular/neurological illnesses ruled out. So, I’m thinking I have possible spontaneous Mdds as I never taken a cruise. Hope this helps anyone in the US and could possibly see Dr. Fox. A connection between a motion event and onset is not always apparent but spontaneous onset is definitely a possibility. The Foundation contacted Dr. Fox when we heard of her innovative therapy, and also have had conversations with the GyroStim company itself as well. GyroStim vestibular therapy is discussed often, particularly in our Facebook Friends support group. However, not enough people who have tried the therapy have completed our patient surveys to produce findings of any significance, whether positive or negative. What you have done, is invaluable. Incredible that you have put such focus into developing a foundation that provides support, research, and financial funding, throughout your battles with this syndrome. A hearthfelt thank you for providing this to myself, and so many others! I want to thank each and everyone of you for all that you have done to improve the awareness for Mal de Debarquement sufferers. It has helped so many people to be able to go to a website and get some answers and realize they are not crazy. New friendships have been created to help with this challenge of life from this site in which everyone needs. I try my best every day but at the end of the day this disease remains for nine years .